Oregon’s imperiled Oregon white oak ecosystems harbor high biodiversity and represent a top conservation priority in Oregon. The 2012 Regional Conservation Strategy highlights the need for more focused oak conservation and stewardship efforts. In 2011, The Intertwine Alliance Oak Prairie Work Group (OPWG) formed to improve conservation outcomes, support enhanced stewardship and public education, and coordinate a regional partnership of over 25 public agencies, park districts, non-profits and community-based organizations. 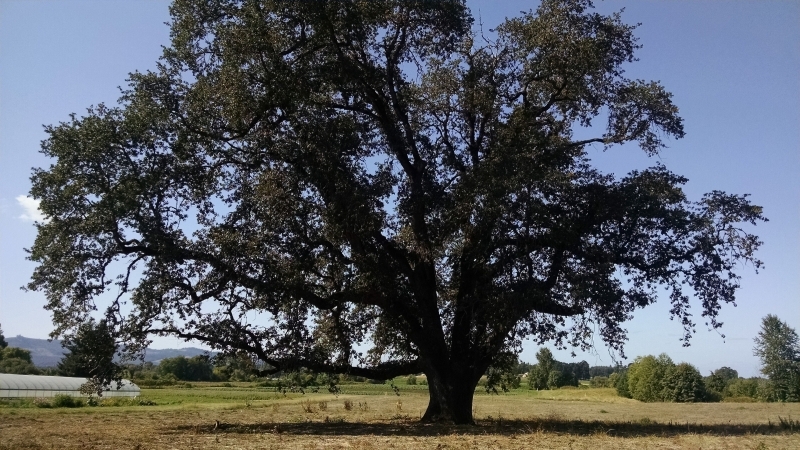 Recognizing the lack of a basic regional inventory of Oregon white oak, initial OPWG efforts focused on development of a regional oak distribution map. Current efforts are centered on strategic planning, enhanced public education and stewardship for oak habitats on private lands, as well as learning and rediscovery of traditional stewardship practices at select public and private sites. Select partners continue to develop and refine a regional oak distribution map. To support enhanced oak stewardship on private residential lands, the OPWG has launched a free workshop series on how to ‘naturescape’ residential yards in support of native oak ecosystems. Key funding partners for this work are Clackamas Soil and Water Conservation District (SWCD), Tualatin SWCD, and the Metro Nature in Neighborhoods restoration grant program. In spring-fall 2016, 45 north Clackamas County residential homeowners will participate in hands-on workshops to learn about and implement native oak naturescaping in their yards. Residential homeowners in the communities of Oregon City, West Linn, Gladstone, Jennings Lodge, Oak Grove, Milwaukie and Lake Oswego are eligible to participate in phase 1 of these workshops. A few openings remain available, so if you are interested please follow this link to sign up now; if you live outside these communities you can register your interest for future potential workshops. Class size is limited to better support learning and interaction with the instructor, Mark Griswold Wilson. The workshops are free, and there may be an opportunity for cost-shared plant materials. Ideally, we are seeking clusters of neighbors and/or landowners in close proximity to a natural area supporting native Oregon white oak. But you do not need to have oak in your yard to be eligible to participate. To register your interest in the workshop series, take this short survey. To learn more about the workshop opportunity, please contact Ted Labbe at ted.labbe@gmail.com. Leave the oak leaves, don’t overprune. Avoid lawns, irrigation and fertilizers under native oaks. Be an ‘oak ambassador’ and talk to your neighbors. KelipiCamas is Chinook wawa for “return of camas” or “return to camas.” Camas, quamash, or Camassia is a native bulb important as a food staple and source of starch for Northwest native peoples. Camas has strong association with Northwest native oak-prairie habitats, and the digging of camas was an important seasonal practice for Northwest tribes. The double meaning of KelipiCamas captures the spirit and intent of the KelipiCamas project: to promote the stewardship and restoration of Northwest native first-foods, while inspiring the culture of stewardship among all modern-day residents of the Northwest. In 2014-15, with funding support from Metro's Nature in Neighborhoods conservation education program, the U.S. Fish and Wildlife Service Surrogate Species program, Oregon Wildlife Heritage Foundation, and Oregon Department of Forestry/U.S. 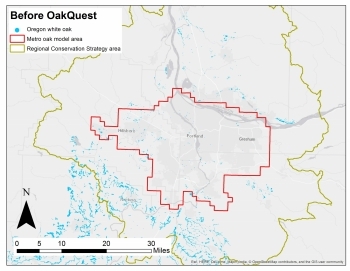 Forest Service, the OPWG launched "OakQuest," a citizen science project to identify Oregon white oak tree distribution in the Portland area. More than 200 volunteers actively mapped trees during the summers of 2014 and 2015. Volunteers contributed over 1500 hours, and gathered nearly 15,000 observations of native Oregon white oak from across the region. Participants learned about oak-prairie conservation and Native American oak stewardship practices. Two college-age Native Americans worked under the auspices of the Native American Youth and Family Center and PSU Indigenous Nations Studies Program to help coordinate volunteers and explore natural resources career and training opportunities. In 2014-15, OakQuest helped ignite a new cadre of volunteers and community members across the region invested in native oak conservation, and it inspired the development of our current stewardship efforts (see above). To complement the volunteer oak observations, OPWG professionals conducted field surveys in October of 2014 and 2015, focusing on non-oak species. In addition, several thousand additional Oregon white oak tree locations were identified and digitized in GIS using high-resolution aerial photos, and we compiled regional street and heritage tree inventories. 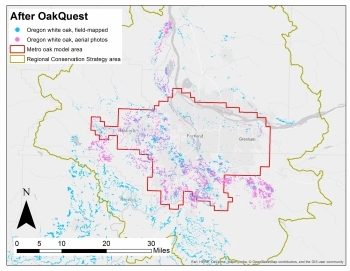 All of these data sets were used to develop and refine a remote sensing model that shows the distribution of Oregon white oak across the Portland metropolitan region. The resulting oak map and data sets are now available to all interested parties, via DataBasin.org. Read all about it, and sign up today.